Church of Ireland Cathedral, Armagh. In the Church of Ireland Cathedral Armagh cross fragments are mounted in the north western corner of the nave. At present two fragments of shaft are mounted together. It is argued that the two are not part of the same cross, but here they will be described as they stand. The measurements of the lower fragment are 1.59 m high, width 65 cm and thickness 38 cm. The upper fragment measures 75 cm high. E1 Adam and Eve knowing their nakedness. Old Testament. Book of Genesis. E2 Noah's Ark. Old Testament. Book of Genesis. E3 The sacrifice of Isaac. Old Testament. E4 Daniel in the lion's den. Old Testament. Book of Daniel. S1 Cain slays Abel. Old Testament. Book of Genesis. S2 David meets/kills Goliath. Old Testament. S3 David slays the lion. Old Testament. W1 The Annunciation to the shepherds. New Testament. W2 The Adoration of the Magi. New Testament. W3 The Baptism of Christ. New Testament. W5 The Second Coming. New Testament. Book of Revelation. N1 The three children in fiery furnace. Old Testament. Book of Daniel. N3 Ss Paul and Anthony breaking bread in the desert. Hagiography. N4 the temptation of St. Anthony. Hagiography. N5 and N6 both panels v. badly damaged. (?) larger figure central with two smaller flanking figures. A fragment has been erected 1m west of the shaft fragments1.2 m across the arms and 34 cm thick. 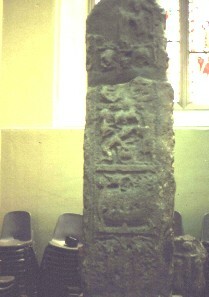 This image gives a close up of the south side, lower fragment of the cross shaft.